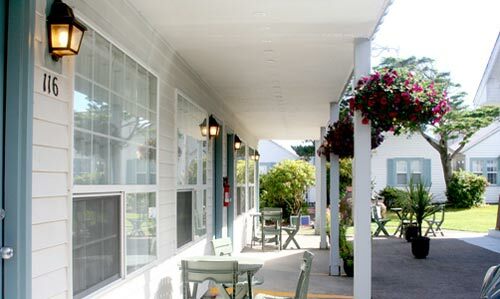 (Seaside, Oregon) – One of Seaside's more stately and reverie-inspiring lodging delights is Hillcrest Inn and Hillcrest House. It’s an oldie on the Oregon coast – about 100 years old. So it’s appropriate you can keep walking just a ways and wind up on the 100-year-old Promenade and right next to the almost 100-year-old Seaside Aquarium. Manager Ruth Swensen said one part of the buildings goes back to 1931, while another part all the way back to 1921. 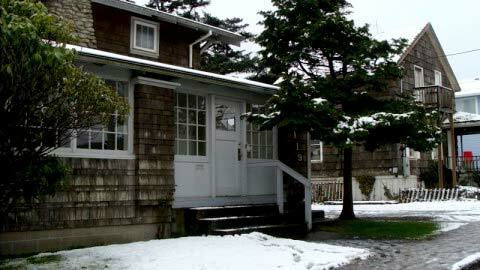 The largest portions of the motel were built in 1931: a series of eight cottages. In 1989, two were torn down to make motel rooms, and a year later another two were razed to add to the motel. That still leaves four cottages, which retain that vintage Oregon coast vibe. It’s become a tradition with numerous families – sometimes for generations of them. Rooms vary in historical vibe, from interior architecture that’s reminiscent of 100 years ago to units that are clearly modern in design and refurbishing, although there manages to be a sense of coastal yesteryear throughout everything. In the more modern units, there’s still hints of the ‘30s or ‘40s in the kitchens, which keeps the sense of charm. Older rooms at the HIllcrest are a bit of a delight: walls and ceilings sometimes dart into odd angles and come together in curious configurations. Window sills and panes simply smack of another age. The exterior bears the brunt of the historic feeling. Those balconies evoke a simpler time, and it’s not hard to imagine people from the turn-of-the-century of the century wandering that walkway. Their vacation rental – Hillcrest House - is a cajoling beauty: a stately structure of weathered wood siding and a white doorway area that also evokes another time. That’s because it is indeed from another time. It was built in ‘21 by a Colonel Dunne, who was a merchant marine stationed in Astoria. It’s a lot bigger than it looks: it accommodates 16, so it works well for weddings, retreats, seminars and other gatherings of size. There are six bedrooms, a fireplace with a wood stove insert, and 2.5 bathrooms that include claw-foot bathtub. It’s all about a half block from the beach, and there are comforting partial ocean views available in some rooms. All of the rooms at the Hillcrest Inn are non-smoking and some are pet friendly. They all have a kitchen, kitchenette or a small fridge with microwaves and coffee pot. Everyone has access to the large set of movies in the library. 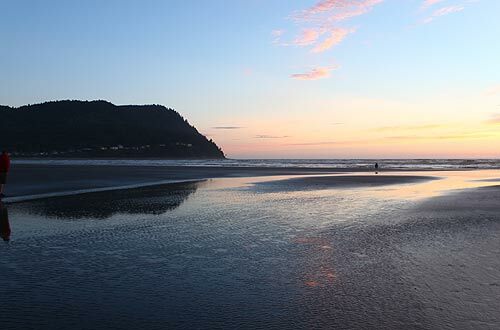 There’s wi-fi throughout the building – and a guest laundry, which can come in handy for those particularly messy Oregon coast moments. Plus, you can save money if you book directly with them. 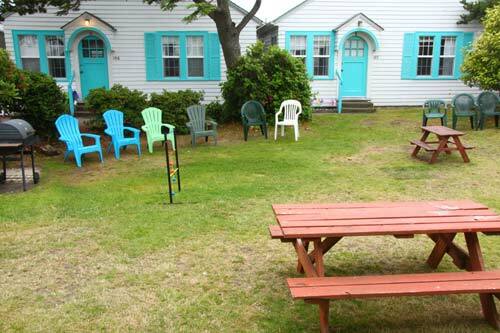 One of the more attractive qualities of this north Oregon coast old timer in general is the courtyard of the motel complex, coming complete with a variety of fun yard games that appeal to kids and adults alike. Such as the curiosity with two balls strung together that you have to get through a set of openings. Or beach balls, or croquet-like games. It’s a kick for all ages. Picnic tables and barbecue grill round out the recreational merriment, where you can dine in the great coastal outdoors. You can also borrow sand toys to take to the waterside with you. They lend out wagons, beach towels and beach blankets as well. 118 North Columbia. Seaside, Oregon. (503) 738-6273. Website here.